Avast, online at Avast.com, is your online resource for anti-virus software. Avast sells anti-virus with anti-spyware. You can also get a free anti-virus program or purchase the Pro Antivirus online at Avast. At Avast, you can buy Pro AntiVirus, Internet Security, and the Standard Suite for businesses. You can also get a 60-day trial version of the Standard Suite, the Small Business Server Suite, the Server Edition, or the Linux/Unix Server Edition. Avast customers can receive free telephone support as well. RetailSteal.com has the best Avast coupons, Avast discounts, Avast coupon codes, and Avast promo codes. Shipping and handling rates at Avast depend on the price of your purchase and your shipping destination. See website for full details. Exclusions may apply. 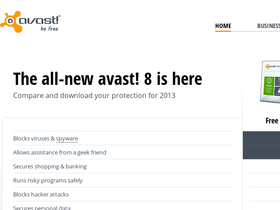 Click link to save $5 off your purchase of Pro Antivirus Version 8 from Avast. Save 20% off a 2-year license for Pro Antivirus from Avast.com. Click link to buy. Act now and take advantage of a $40 discount on the Total Protection Package from Avast.com. Click here for bundle savings. Get Internet Security at Avast for only $49.99. Click link to shop online. Act now and get Avast Software for Mac for free! Click link to buy. Try Avast Antivirus software completely free for 30 days. Click link for download.